This is a tour for beginners. But it means you have to have a good basic condition, Ski tours is nothing for untrained people. We will do a tour of around Protected content meters on the left side of the ski area. we will first go down to Vallep Lift, then we put on the fells and go through the forrest up the Grünsee Tour. In the end we will cross the ski slope and finish to the rosskopf on the right side of the slope. This part will be a little bit steeper, but it is still quite easy to go. It will take us about 2 hours to go up, when we go in a smooth way. 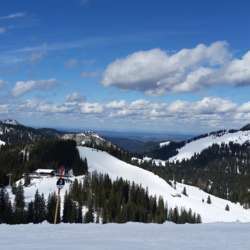 From the top of Rosskopf we go down on the ski slope to the Jagahütt'n and will have some food and drinks. Be aware these are black and red slopes. When ever we want to go back we will ski down to the parkingplace to our cars. Please check for carsharing, there are not so much parking lots. I can take 3 more people in my car. AND if you need a ski tour set, there is a renting station in the village you pass directly 2 km before to the parkingplace. It is called Ingos Skiverleih Protected content Please book them in advance call there to make shure they have shoes in your sice and be in time to rent them out. It will need about 30 min. There are no costs only your own needs in beverage and for the drivers a participation on the driving costs, all on privat agreement. AND PLEASE NOTICE: I am NOT a professional tourguide, I am NOT certified in avalanche rescue or guiding technics. I just propose a tour on privat level. You go on your own risk and you have to check the risks in advance by yourself. When you join this tour, you agree to this conditions. I dont take any responsability for anybody.